What does it look like? Where does it grow? How to treat it? Links to more info. 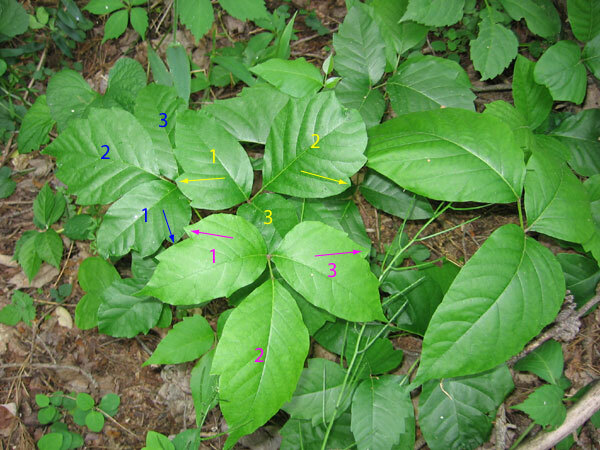 There are two main pieces of knowledge that will help you recognize poison ivy nearly every time. • Leaflets three--let it be. • And, the other secret that not many people know. Poison ivy has thumbs. Once you get those two facts down, you'll be set. while the central leaf is either smooth margined or has symmetric zagged margins. The links listed below will give more details. • If you know you've touched PI, and there's a source of water, wash it off as soon as possible. • Finally, if I don't catch the PI until the rash has developed. Zanfel works for me to take away the itch. • Calamine can work to dry up the rash. I've not had success for the first few days of heavy oozing. But after that, the calmine does seem to help. • Cortisone is worthless, for me (for PI). I haven't needed a steroid prescription.